"If you want to know all about Andy Warhol, just look at the surface of my paintings and films and me, and there I am. There’s nothing behind it." 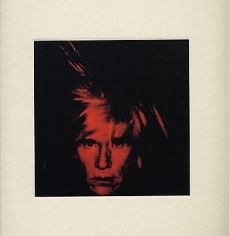 Van de Weghe is pleased to present an exhibition of Andy Warhol’s Self-Portraits. The first New York show devoted to Warhol’s images of himself, it includes more than thirty-five paintings, with examples of almost all of the self-portrait images that Warhol made throughout his career. Warhol first silk-screened his own image in 1963 for a commission by collector Florence Barron based on a Photomat strip. He continued to pose for himself throughout his life in all manner of roles: outlaw, businessman, ghoul, drag queen, and many more. While Warhol made many Polaroid and drawings self-portraits, this exhibition’s focus is on his trademark silkscreen ink on canvas works. Warhol executed each image or “type” of portrait in a range of colors and combinations with various nuances of screen on the surface. No artist in the twentieth century, if ever, has been so deeply engaged with the representation of his or her own likeness as Warhol. Of course, Warhol’s art is intimately and intricately involved with his persona. Decidedly posed and willfully enigmatic, his Self-Portraits are deliberate performances of the artist’s persona and image that do, in fact, reveal very little and keep us enthralled with Warhol’s mystique. The gallery publishes a fully illustrated catalogue to accompany the exhibition, featuring an essay by Vincent Fremont.